Detecting an unpleasant odor caused by a broken or blocked sewer pipeline in your home or business is a very unpleasant experience. NuFlow St Louis has a dedicated and experienced team ready to locate the offending part of your sewer pipeline quickly and efficiently, and perform the repair needed. Most building owners, when experiencing the symptoms of a broken, cracked, corroded, or worn sewer pipeline expect their landscaping to be torn up, their home or business to be trampled with dirty work boots from a large crew, and huge machinery outside for many days. They expect a lengthy disruption of business or home schedules. Fortunately, the repair is no longer such a dismaying consideration. At NuFlow St. Louis, we are proud to serve the St. Charles community with our quick, efficient, and cost-effective, newer repair methods. We begin our diagnosis of your pipeline issue by deploying a waterproof robotic camera and optic cable into your pipeline. Entrance is usually gained through the pipeline access point, a small, capped section of your pipeline outside but near the building. Our team will be able pinpoint the entry access cap quickly simply by determining the location of your buildings’ bathrooms and kitchen. As the robotic camera is deployed, it sends a video of the interior circumference of the pipeline to our team member. The camera is able to record footage of the pipeline from your building all the way to the connection with the municipal sewer line at the curb of your property. Once the camera inspection of your pipeline is complete, our team member will define which parts of the pipe needs repairs. NuFlow St. Louis uses the newer, more efficient method of pipe repair called the cured-in-place pipe (CIPP) liner process. The CIPP liner process does not require the digging up of your landscape, a large workforce, or giant machinery. The process is able to be quickly installed so it won’t disrupt your household’s schedule for multiple days. The CIPP liner process is a trenchless pipe repair method. It requires a few hours or a day to complete. The CIPP liner consists of an inflatable bladder and a liner infused with a strong epoxy resin. The liner is inserted into your building’s pipeline. The proper location is confirmed using the robotic camera. The liner is then inflated, pressing the epoxy resin against the interior wall of the existing pipeline. The epoxy resin is allowed to cure for a few hours and the liner material is removed. The robotic camera is once again deployed to confirm the repair was completed correctly. More than one location of repair can be performed, if necessary. The end result is a strong, durable pipe within your original pipe that has an expected lifespan of 50 years or more. 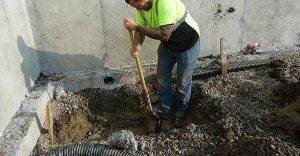 Solving the symptoms of a sewer pipe malfunction is an easy task for our team at NuFlow St. Louis. We can finish the job quickly, with minimal team members and equipment, allowing your business to resume normal function promptly or you house to continue serving as a place of comfort. Please contact our team at NuFlow St. Louis for more information. Let our reliable and precise team members ease your concerns and complete any repairs as necessary.